Destiny Paige Chambers, age 8, passed away on Thursday, September 27, 2018 at Freeman West Hospital in Joplin. 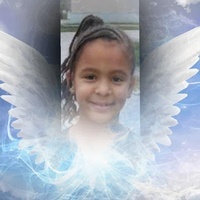 Destiny was born in Shreveport, Louisiana on July 17, 2010 to Walter Chambers and Jennifer Leger. Destiny was attending the third grade at Soaring Heights Elementary School in Joplin, Missouri. She loved to play with her family and friends. She could spend hours making and playing with slime. Destiny absolutely loved doing her own makeup and nails and she would do anyone else’s that would let her. She enjoyed shopping, using the phone, playing Minecraft and listening to music. Destiny loved food, her favorite was pizza and cereal. She enjoyed all types of candy but her favorite was Kit Kat and gum. Destiny was a happy child who always had a smile on her face. She will be greatly missed by all who knew her. Destiny is proceeded in death by her uncle, Rusty Leger. In addition to her parents, survivors include a sister, Tia Chambers of Joplin; step mother, Natasha Johnson; step sisters, Zion and Adriana Johnson of Joplin; step father, Frank Owens Jr.; step brothers, Frank and Felix Owens of Joplin; her grandparents, Edna and Harris Leger and Caroline Edwards; Uncles, Jerry Chambers and Thomas Burkhart; aunts, Megan McGuirk, Michaela Ali, Darnequitth Chambers, Shonveyon Johnson, Willow Leger, Alexis Leger; and many cousins. Funeral services are planned for Monday at 12:00 p.m. at Parker Mortuary. Interment will follow at Ozark Memorial Park Cemetery. The family will receive friends on Monday from 10:00 a.m. until service time.